In buona parte della Grecia sta nevicando ed a Leros sfruttiamo una finestra senza troppa pioggia e vento per alare la barca. A Salina non termina la nostra crocera di fine anno….il 1 gennaio di buon mattino si ripartirà verso Catania. Previsto pioggia, vento sui 15/20 nodi e onda di 1,5 mt……. Domani notte siamo invitati alla festa a casa di amici dell’armatore… poi il rientro a Catania… E poi a casa. La mattinata con splendido sole e temperatura mite è dedicata alla visita di Panarea, compresa la bellissima casa del nostro armatore. Dopo circa 12 ore di navigazione da Taormina siamo arrivati con il buio all’isola Vulcano con sosta nella Sciara del fuoco. Abbiamo avuto fortuna ed abbiamo ammirato per circa un’ora lo spettacolo delle eruzioni. Ci siamo poi diretti a Panarea per la notte. for registered users in the Cruise menu. 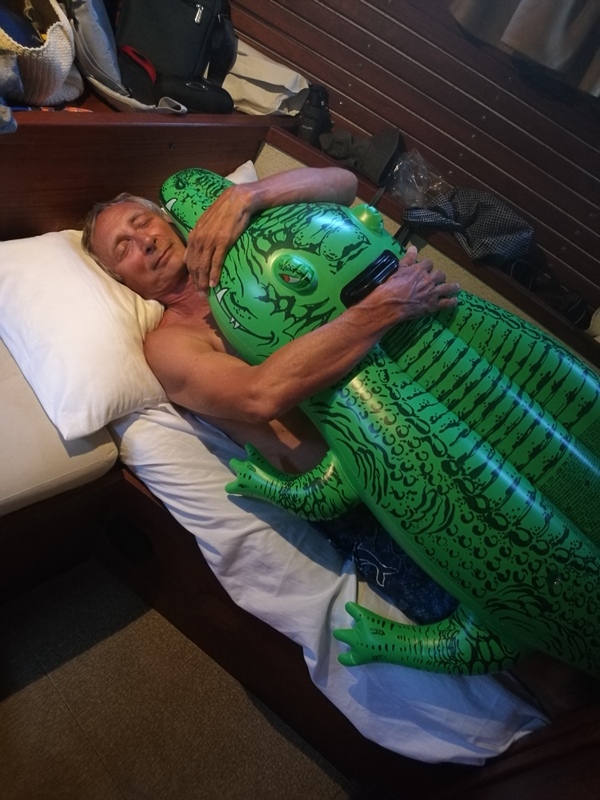 An incredible story about rescuing, friendship, sailing and crocodiling. This story started two days ago. Just after a stormy moment, we saw far away, a green buoy floating over the sea, trying as good as possible not to drown. The situation was obvious, “MAN OVER BOARD”, the captain shouted. Used to training MOB (Man Over Board), the fantastic crew of La Bum decided to save this green buoy. By arriving closer, we understood this green buoy is nothing else than a crocodile. Even if the weather was windy and the sea was wavy, Basile with his famous fisherman skills, harpooned the crocodile and brought it inside the ship. At this moment, none of the crew could imagine this crocodile would become so much more than a beach kid game. After a few hours, the crocodile, welcomed by the whole crew, became a new member of La Bum. Very skilled as a helmsman or as a deckhand, trimming the sails, Crocodile has become an important member of the crew (maybe the most important one…). This evening, Crocodile is cooking, preparing us some good pita breads and good burgers. A perfect Chef Cuistot! Regardless of all the good things he does, Crocodile is cheeky, always trying to sleep in Luigi’s bed, or making pranks to Renato, he is at the center of our attention… All day-long. Hopefully, Crocodile is going to find a new owner under 12 soon, to take care of him as he deserves! 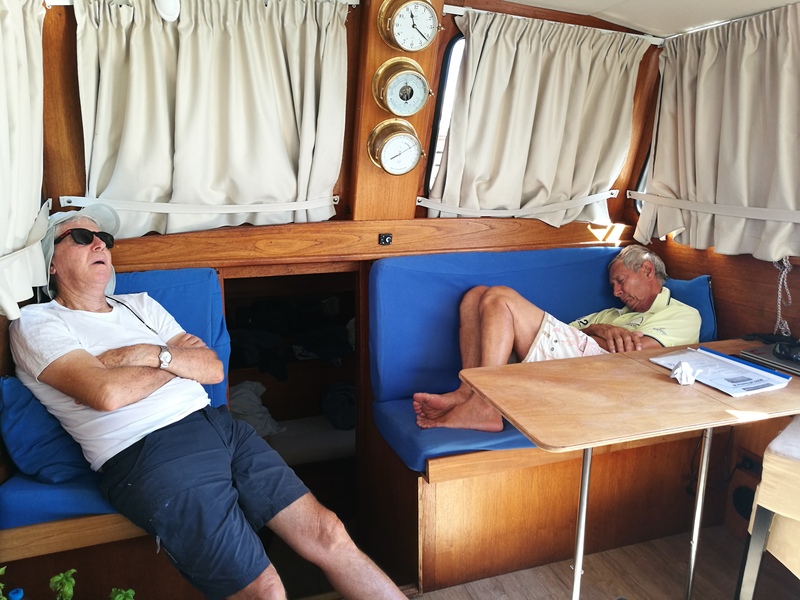 At the moment Renato still tries to understand the situation… The senior crew is exhausted after two days of being with this new crew member. is Nauticat 33, a motor-sailer boat built in 1980 in Finland, kept and run by a group of friends who enjoy sailing and exploring the seas.